VentureBeat have reported on the latest market research by Good Technology showing that Apple have managed to claw back some market share within the enterprise space. 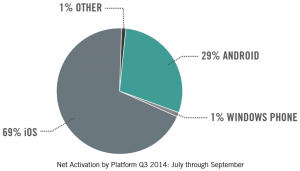 iOS now accounts for 69% of activations within the enterprise, with Android accounting for 29%. This reverses recent gains made by Googles Android OS. The latest data has been released by Good Technology in their Mobility Index Report. Despite having only just been released the iPhone 6 and iPhone 6 Plus remain strong contenders within the enterprise space in part because of the perceived quality of the products and the good security and management provided by Apple. The graph shows a great visualisation of the current breakdown of the market. The most interesting figure has to relate to Microsofts market share. The King of the Enterprise, which still has its software on the majority of enterprise desktops, has continuously failed to make any headway in pushing their devices in to the enterprise. Their share has remained stationary at a whopping 1%. Quite how Microsoft can lead the market in so many areas and yet fail to get their devices taken seriously shows both how far from the mark their devices have fallen and also how they have failed to understand the needs of both users and IT departments. With the anticipated security and management features included in Googles new Android 5 OS, and with solid business focused tools such as Samsung Knox seeing traction, Androids share of the enterprise market is sure to explode in upcoming years.